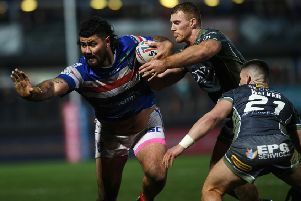 Despite a plucky effort when they came from 16 points down to be only six behind at half-time Wakefield Wildcats were blown away in the second period in their Magic Weekend game against local rivals Castleford Tigers at Newcastle’s St James’s Park. Wingers Denny Solomona and Ashley Gibson raced over for seven tries between them as Castleford ran out convincing 56-16 winners in the end with the Wildcats unable to score a single point after the break. Wakefield were given a big boost before kick-off when it was announced live on Sky TV that top Australian coach Brian Smith had been appointed as the new head coach, but they made a dreadful start when 16-0 down in the first 10 minutes. Castleford scored first when Adam Milner’s charge down put them in good field position then Michael Shenton sent Solomona over in the corner for the opening try, goaled from the touchline by Luke Gale. Within two minutes Solomona scored again after collecting a fine looping long pass by Gale and although there was no conversion it was 10-0. Cas struck again on nine minutes when Shenton made a superb break down the middle and Jordan Tansey backed up to score a try goaled by Gale to make it 16-0. It was looking easy for the Tigers at this stage, but following another dangerous break by Oliver Holmes his pass was intercepted by Wakefield winger Tom Johnstone, who promptly raced 70 metres for a surprise try goaled by Jacob Miller. Suddenly the Wildcats found some confidence and on their next attack they scored again as Gibson dropped a high kick and Daniel Smith pounced on the loose ball to go over for another try goaled by Miller. After a period of stalemate the Tigers recovered their composure and stretched their lead with a Shenton try in the corner after he dummied his way into space then left Johnstone on the ground. Gale goaled. But after Solomona was then denied another try when he just touched the sideline with his boot in his attempt to dive over Johnstone hit back for Wakefield with a try in the corner. Miller could not goal, but the Wildcats could be relieved that they were only 22-16 down at the break. With the game in the balance Wakefield initially made the better start to the second half as they forced a drop-out. But the pressure came to nothing and once Solomona stretched the Tigers’ lead with his hat-trick try it was one-way traffic from this point. The try owed a bit to luck as Owen slipped as he looked to deal with Gale’s kick into space and the Cas winger took full advantage to scoop up the loose ball and stroll over for a try goaled by Gale. Three minutes later Gibson squeezed over in the corner and it was 32-16. Cas lost Milner with a suspected broken nose after an accidental clash with team-mate Junior Moors, but continued to dominate and scored again on 58 minutes when Gibson went over in the corner following Jake Webster’s offload near the line. Gale converted and landed another goal four minutes later after Solomona had collected his fourth try, catching the ball after Wildcats defenders Owen and Johnstone had got in each other’s way trying to take Gale’s high kick. Solomona was only inches away from another score that would have made him a Castleford record breaker, but there were more points to come in the last 10 minutes. Gale backed up well to get a deserved try after Solomona’s initial kick return and a fine burst by Holmes. Gale’s conversion brought the half century up and the Tigers rounded off the scoring four minutes from time as Gibson completed his first hat-trick for Cas with another fine finish and Gale added his eighth goal, six of which came from the touchline. Scorers - Castleford: Tries Solomona 4, Tansey, Shenton, Gibson 3, Gale; goals Gale 8. Wakefield: Tries Johnstone 2, D Smith; goals Miller 2. Castleford Tigers: Tansey; Gibson, Webster, Shenton, Solomona; Finn, Gale; Lynch, Moore, Millington, Holmes, McMeeken, Massey. Subs: Milner, Boyle, Moors, Maher. Wakefield: Owen; Johnstone, Collis, Lyne, Riley; Miller, T Smith; Scruton, McShane, Anderson, Washbrook, Kirmond, Molloy. Subs: Godinet, Ryan, Simon, D Smith.